These instructions are for Gravity Forms 2.2 or higher. For previous versions you will need to use the ‘Logging Add-On’. 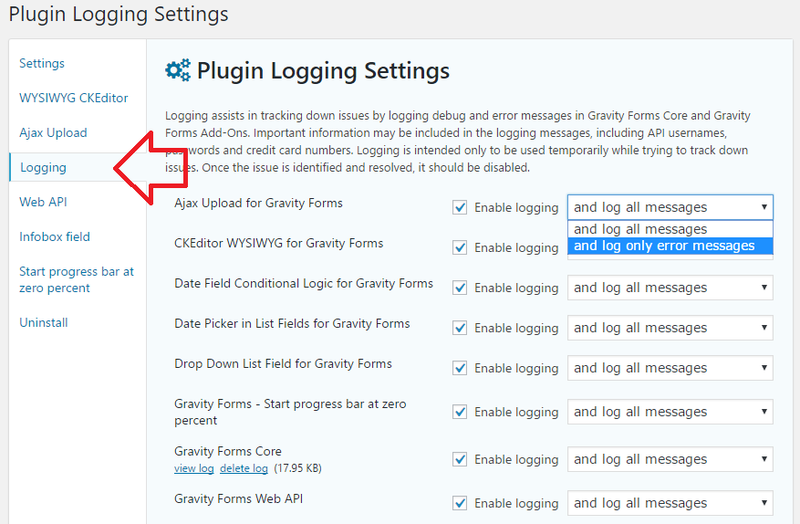 Logging allows you to audit events that have occurred inside Gravity Forms – this can be helpful when debugging a plugin or talking to support staff. Note: only events that the plugin developer has chosen to be logged will be included. If the plugin does not log any events the log will not contain any information. Logging is disabled by default but can be enabled from the ‘Forms’ -> ‘Settings’ menu. Once enabled logs can be accessed and configured in the ‘Forms’ -> ‘Logging’ menu. Gravity Forms Core as well as any plugin that uses the addon framework will be listed. Each plugin is logged by default and can be disabled individually. You can also choose to log all messages or only error messages. Logs are accessed from the ‘view log’ link below each item – this link is publicly accessible (but obscured using a unique hash code) and can be shared with support staff. 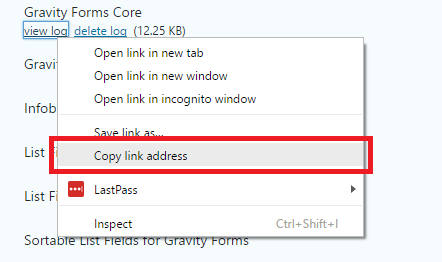 Simply right-click on the ‘view log’ link and choose ‘Copy link address’ (these words vary depending on which browser you’re using). In you message to support staff paste the link address.